Keeping Up With the Joneses: Itsy Bitsy! This little guy was running around in my kitchen and Kaleb spotted it. He came over to me and said, "Mom, there's a spider underneath Dad's computer." I shrugged and said, "Okay." He said, "No, you need to squish it." He moved the computer so I could see the spider. Sigh. "Okay, get me a tissue." Then he changed his mind and decided to be brave. "No, wait. I want to squish it." Okay. I had seen these spiders before, so I was curious what kind they were. 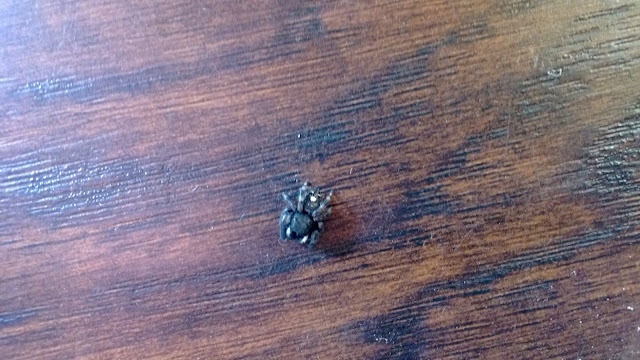 I said, "Before you kill it, I want to take a picture of it so I can find out what kind it is." "I know it's not a black widow." "No, it isn't a black widow." "Okay. You better take the picture before I find the tissues!" I pointed to the tissues as I grabbed my phone and said, "The tissues are right there." He wanted to squish it with his foot, but I wouldn't let him. Riley had just mopped the floor. He was so brave, though. He took that tissue, squished the spider and said, "So that's what it feels like." He he he. I think he will be able to squish his own bugs from now on. Always called them jumping spiders. I have seen them jump away as I try to squish them. Lady Riverdale to the Rescue!